Appearances can be deceptive! Our anarchistic attempt to get Southwark Cyclists to a "Healthy Ride+" on a day when they are supposed to do just a "normal" "Healthy Ride" did not appear to meet with much success. But ensuing discussions amongst the riders concluded that there might be thousands of cyclists who have done rides such as the London to Brighton ride, but who are finding it difficult to find a suitable cycling club in the area that they can join. On this occasion, several Southwark Cyclists had turned up half an hour early for their ride and we were able to talk to them. However, although one declared herself to be an "interloper" and we thought that was exactly the sort of person we need in our cycling group, this was to no avail and she wanted to go on the 10am ride. Another person said she had been on our rides before, but she too wanted to go on the 10am ride. Someone else said he might have come on our ride if it had been a bit shorter, but didn't want to spend 4 hours doing a ride. So there were just two of at the Dulwcih Clock Cafe start point who boldly set out on our ride to Keston. The only problem was it was difficult to retrieve my bicycle as there were not enough bike racks and my bike had been surrounded by Southwark Cyclists' bikes and was trapped in a pincer movement (https://en.wikipedia.org/wiki/Pincer_movement). Fortunately there were couple of new people who saved the day by breaking ranks with those who were trying to impose a communications blackout on Cyclists in Southwark. One had been intrigued by all the things we had been saying on Facebook! We had first to climb the massive hill to get over to Forest Hill, where we found that the "P' word was much in evidence on the sign posts. 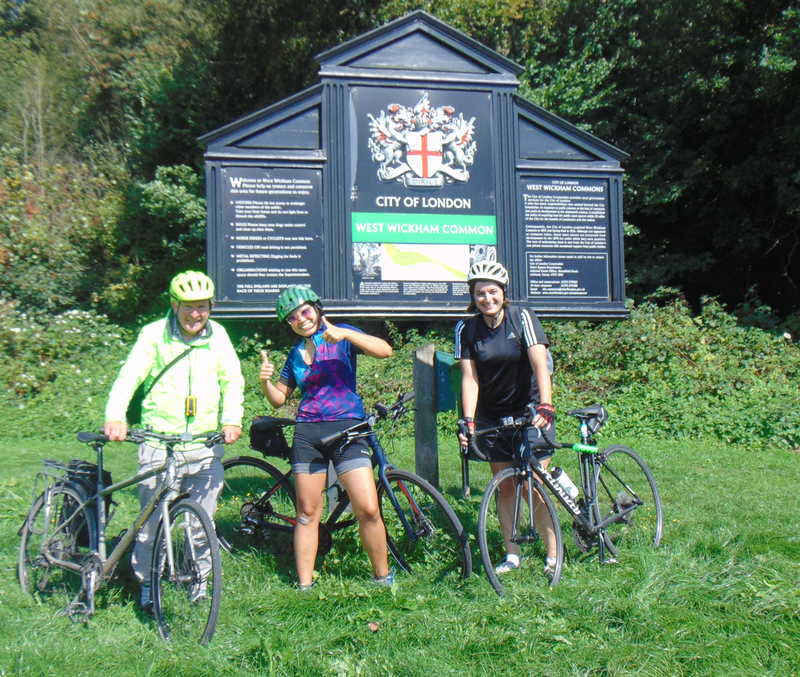 We then joined the Waterlink Way which took us to Beckenham Place Mansion, we were met by a third rider. We then went past Shortlands and Bromley Town Centre to the A21 cycle path and folloed this to Farnborough and High Elms. We saw some stewards ushering in cars to a Bexley Round Table event and thought isn't this Bromley not Bexley? When we climbed up the hill from High Elms to Downe we were over taken by a group of about six Dulwich Paragon Riders and though surely this is Bromley, not Southwark. We did attempt to keep up with them, but to no avail. We soon reached the the Hollywood Farm Coffee shop, where we were joined by a fourth rider, who had been on our Biggin Hill Airshow ride. The year long boycott of our rides by Southwark Cyclists is causing problems for us as none of our riders has ever been on a Southwark Healthy Ride and this means that means that they have great difficulties in finding places such as the Dulwich Clock Cafe, which are located in the heart of Southwark. Our discussions are starting to reveal how Cyclists in Southwark fits in the tapestry of cycling groups in London. Whereas Southwark Cyclists is using Dr Bike sessions and "Healthy Rides" as a means to get new people involved in cycling, Cyclists in Southwark is using a different approach to find new riders. Thousands of people are being attracted to cycling by doing longer rides like the London to Brighton one, however they appear to be having serious problems finding a suitable cycling club to join. Many cycling clubs are "full-on" ones and segregate women into "women-only" sections, or are located in far-flung pats of SE London (eg. Penge/Bromley, Limited Edition/Greenwich and Sidcup/Bexley), which is very inconvenient for those of us who live in boroughs such as Southwark, Lambeth, Camden, Westminster, Kensington & Chelsea, Tower Hamlets and Newham. On the way back it was mostly downhill and it didn't take long for us to reach Beckenham Place Mansion and the Waterlink Way. At Bell Green we split up as we were all from different boroughs - Lambeth, Camden, Lewisham and Tower Hamlets.